Exklusives Hotel am Strand Es war sogar noch schöner als auf den Fotos, alles war vorhanden, Sprudelbad mit Sicht auf das Meer im Badezimmer. Separates Waschzimmer, konnte all meine Wäsche waschen. Küche mit Kochinsel. 1 Bad mit Dusche und ein ein zusätzliches mit Dusche. Beautiful rooms close to the beach and restaurants Beautifully presented and well equipped rooms close to good restaurants and bars. Spacious and central Great location and good for the trams. Property is a bit tired and in need of update / decoration. 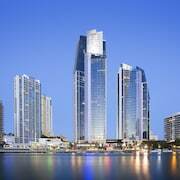 The most celebrated hotspot in Queensland, Gold Coast certainly lives up to its name. Sun-burnished sands, crystalline waters and tropical temperatures all add up to a dreamy coastal paradise where you can be as active or lazy as you like. 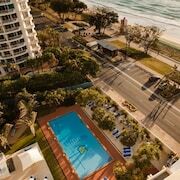 The surfing here is legendary, and even beginners will be tempted to hit the rolling waves. Yet you can just as happily spend all your time basking on the beaches or hitting the local bars for frosty beers and cool cocktails. 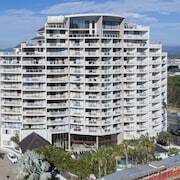 Foodies will also have reasons to be excited, with local eateries making the most of the coastal context and serving up gleaming sushi and grilled, butter-basted lobster. 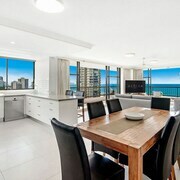 Grab the sun cream and head for Gold Coast holiday rentals to soak up the idyllic vibes. 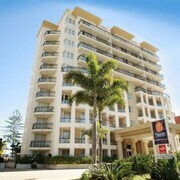 Why book Gold Coast holiday rentals with ebookers? 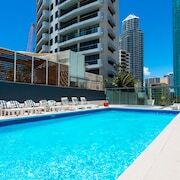 While this part of Queensland is known for its tall, gleaming hotels, if you’re looking for a real home away from home, there’s no substitute for Gold Coast holiday rentals. 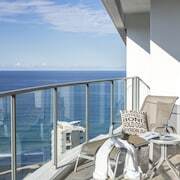 Instead of having to fit with pre-set breakfast schedules and jostling alongside hordes of other visitors, you’ll be able to lie back in your own, spacious holiday apartment in Gold Coast, enjoying unparalleled privacy in serene surroundings. 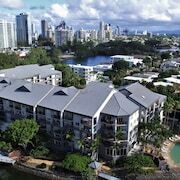 Using ebookers, you’ll find a wealth of potential places to choose from, with many located in the most sought-after parts of Gold Coast. 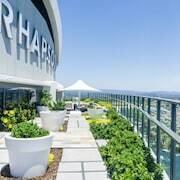 So, whether you want to stay in lively Surfers Paradise, chic Broadbeach, or the perfectly located Main Beach quarter, you can instantly make it happen. 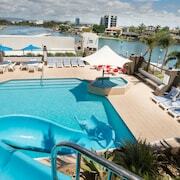 Want to get close to some true Aussie icons? 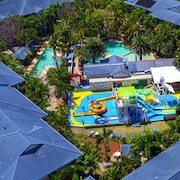 Head over to the Currumbin Wildlife Sanctuary, where you can mingle with wallabies and kangaroos, cuddle koalas and even feed saltwater crocodiles if you’re feeling brave enough. 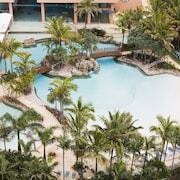 Segway safari tours are also on offer, letting you take in this emerald-green slice of nature. 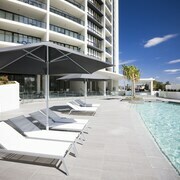 Of course, when it comes to things to do near Gold Coast holiday rentals, the beaches must come near the top of the list. 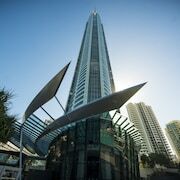 Surfers Paradise is the most exhilarating stretch, where smooth sands meet a backdrop of silvery skyscrapers, and where you can switch from the waters to the beach bars whenever the mood takes you. Surfing is a very big deal here, and there’s even a museum dedicated to the sport. Surf World showcases colourful boards, as well as vintage photos and memorabilia that sum up the surfing scene in Australia. Here with the family? 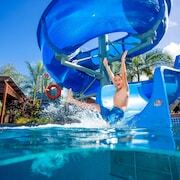 Treat them to a day at Sea World, where kids will love seeing the waddling penguins and friendly dolphins. 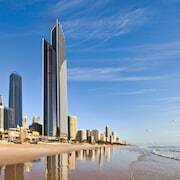 Visitors come to this part of Australia to relax rather than bustle about, and you could certainly spend your whole stay here simply ambling from your Gold Coast holiday rental to the beach and back again. That said, reliable public transport is easily available, with a light rail service connecting major areas along the coast. Hiring a car can also be a good option if you like the idea of exploring the lush hinterland, where scenic drives will take you through dramatic mountain scenery.